Oil production in the North Sea will drop by 330,000 barrels per day (bpd) month-on-month in June 2019 as Ekofisk closes for planned work, according to Rystad Energy’s latest forecast. “Production is expected to remain stable through April 2019, before dropping 80,000 bpd month on month in May 2019. 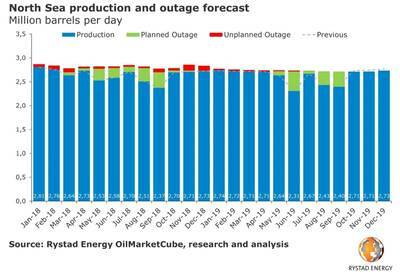 The decrease will continue in June 2019 with an additional 330,000 barrels per day month-on-month drop, as we expect maintenance at Ekofisk feeding fields to impact output by 220,000 bpd,” says Milan Rudel, an analyst with Rystad Energy’s Oil Markets team. Brent Ninian Blend - Brent Ninian Blend production will periodically slide again over the year, falling to around 80,000 bpd by December 2019. Forties Blend - This year’s trough of Forties Blend production will be at around 270,000 bpd for August 2019. Significantly less turnaround activity is expected this year than historically observed. Oseberg Blend - Oseberg Blend production increases to 129,000 bpd for December 2019, from 104,000 bpd for December 2018. No significant maintenance activity is expected. Ekofisk Blend - A major turnaround campaign is expected at the Greater Ekofisk Area (GEA) and other Ekofisk Blend feeding fields in June 2019. Historically, GEA fields had maintenance every three years in June, during which time the fields are closed for most of the month. Other fields, such as J-Block, have maintenance every year, often occurring in June as well. The impact of maintenance on the other fields tends to be greater during years when GEA undergoes maintenance. It will impact output by 220,000 bpd. Troll Blend - Production will increase to 207,000 bpd in December 2019, from 181,000 bpd in December 2018. New fields - Projects that started up since 2017, or are scheduled to come online, will produce more than 1 million bpd by December 2020, representing an increase of almost 700,000 bpd from December 2018. Net impact will be around 400,000 bpd. API Gravity - Our OilMarketCube, which provides a complete field-by-field overview, shows the average API of North Sea oil output gradually declining to 34° by December 2020. New projects will have an average API of 27°.